Those in the fishing industry are likely well aware of the Abu Garcia brand. The company introduced its first fishing reel in 1941 and later added its first Ambassadeur fishing reel about a decade later. Although the company has expanded its product line to now include everything from rods to apparel, the Ambassadeur continues to remain a staple of the company’s production. The Ambassadeur SX is a cost-friendly fishing reel, perhaps best suited for those who are looking to upgrade their stock equipment for the first time. The reel is more massive than other modern options but should provide a considerable upgrade over the stock reel that comes included with a fishing rod. The Ambassadeur SX from Abu Garcia is worth considering if you’d like a durable product that will work well under the toughest of conditions. Abu Garcia has been manufacturing the Ambassadeur for years and the design is well-tested. Although customers could find lighter or sleeker options, the Ambassadeur is proven to work time and time again. One of the things that stood out most about this product was the crafted machined aluminum that featured a compact bent handle. This allows fishers to gain better control of the rod, bringing them closer to the action. This was especially critical when handling more massive fish. Customers indicated that the reel held up against fish weighing up to thirty pounds. We also appreciated the multi-disk drag system design that Abu Garcia implemented into this product. Anglers should find that the reel release is smooth and consistent. They should notice that pressure holds consistent and steady across the entire drag range. Part of this is also due to the synchronized-level wind system, which helps boost the line lay and castability. The Ambassadeur SX also comes with a clicker, which helps anglers control the braking system. When used properly, the clicker should allow for pinpoint braking accuracy. As we note below, some customers found the clicker challenging to engage and disengage. However, a dab of oil on the clicker could help loosen it so that it operates more smoothly. Customers will also appreciate that this product is available in both right and left-handed options. There are six different models from which they can choose. There are some minor variations in weight, as more modern options shed an ounce or two from the overall weight. But the most significant difference among models is the fact that there are options for both right and left-handed anglers. The other major sticking point for us was the price. Customers can purchase this product for less than $80, which makes it well worth considering. We believe customers receive excellent value at this price, especially when considering the product’s durability. There’s no reason why this product shouldn’t perform well for years. Abu Garcia also offers a one-year warranty against defects on this equipment. 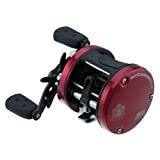 Although we believe that this reel is an excellent choice for those looking to upgrade their stock equipment, it falters in comparison to some of the more modern equipment in this price range. The Ambassadeur SX is incredibly dense, weighing almost 14.5 ounces. Compare this to the Revo SX from Abu Garcia, for instance, which weighs about 6.65 ounces. That’s a tremendous difference! Additionally, the specs on this product lack considerably compared to competitors. For instance, the gear ratio is 5:3:1, providing a minimal turn. Again, compare this to the Revo SX, which provides up to a 7:1:1 gear ratio. Furthermore, the Ambassadeur SX only features three ball bearings. This impacts the bait alarm and clicker, perhaps making it difficult to use. Lastly, we were disappointed with the fact that Abu Garcia made this product in China. Abu Garcia is a Swedish company. Many customer reviews seemed to indicate confusion. Many customers believed that they were ordering a product made in Sweden, only to find out that it came from China. It’s not necessarily a deal breaker, but it’s worth mentioning for full-disclosure purposes. Dana R. noted that she used the Ambassadeur SX in saltwater and that it held up quite well. She said this was notably different from other casters that she used, which performed well in fresh water but broke down in saltwater. Dana said that she fishes three to four times per week and that this reel has held up well. She also noted that it casts well and that it is her go-to reel for trout and snook. Adan M. said that the Ambassadeur SX is an excellent reel that has allowed him to catch catfish. He said that the first catfish he caught while using the reel was 16 pounds and that the equipment performed well. Adan noted that he used a 20-pound braided line as well as a three-ounce weight without any problems. Buddy indicated that the reel was “smooth and strong” and that is performed well as his primary rig for striper and catfish. He also stated that he had used this reel to catch bluefish and flatheads weighing as much as 30 pounds without issue. Buddy did have one minor complaint about the rig, noting that he had some difficulty engaging and disengaging the bait alarm and clicker. If you’re looking to upgrade the stock reel that came attached to your current fishing rod, you’ll want to consider the Ambassadeur SX from Abu Garcia. Although this reel is a bit heavy and does not have the highest gear ratio, it should still prove to be a considerable upgrade to stock equipment. Abu Garcia is a trustworthy brand, and this product is affordable compared to other options available on the market.